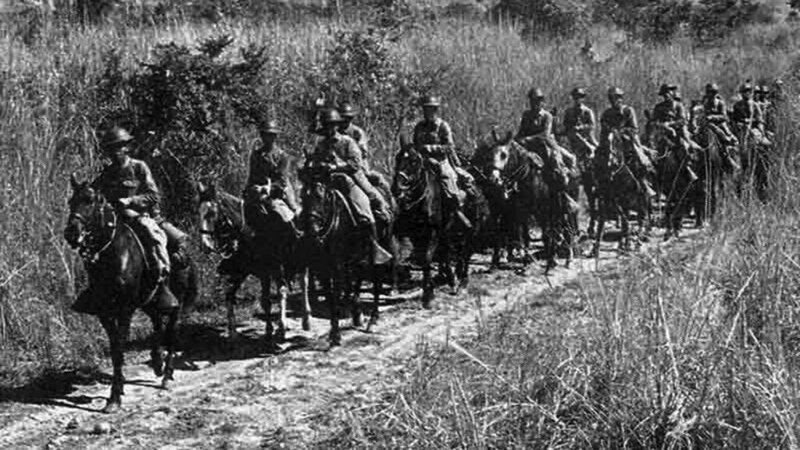 Lolo Juaning was a skilled horseman and served as a Cavalry officer for the Philippine Scouts. Several weeks back, my aunt clued me in on the fact that my Lolo Juan worked with Jorge Vargas (how closely, I am unsure) in the administration of Manuel Quezon in the 1930s. Jorge Vargas was the executive secretary of President Quezon, and eventually, the head of the Philippine Commission after the country was invaded by the Japanese forces in World War II. After a bit of googling, I learned that Jorge Vargas’ private papers and photographs are housed at the Vargas Museum in UP, Diliman. I sent an email to the Librarian, Maricel Raynesa, and we set a date to view the collection. The gracious Ms. Raynesa even asked her student interns to start reading through the volumes to look for any mention of Juan Anderson Hernandez, which facilitated the search. 1. 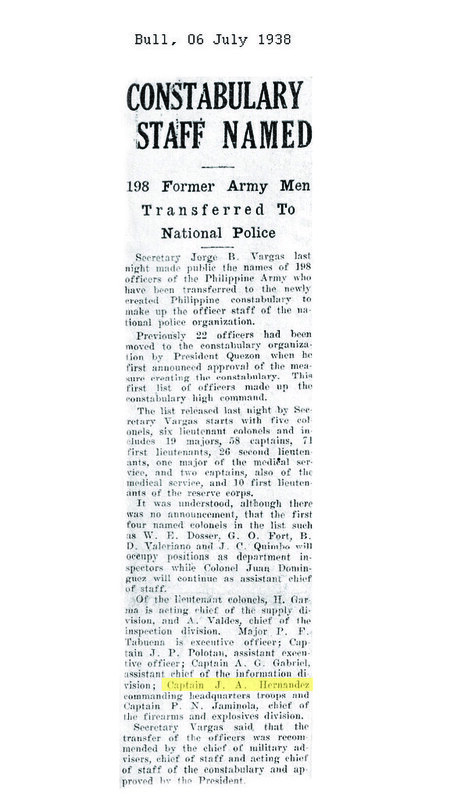 In July 1938, Juan Anderson Hernandez was among 198 officers of the Philippine Army who were transferred to the newly-formed Philippine Constabulary, the national police organization. Captain Hernandez’ responsibility was “commanding headquarters troops”. Considering the timing, it seems that he held this post a short time before or at the same time as his job as the sergeant-at-arms of the Second National Assembly. 2. Shortly after World Ward II broke out, the open city of Manila was occupied by the Japanese in 02 January 1942. 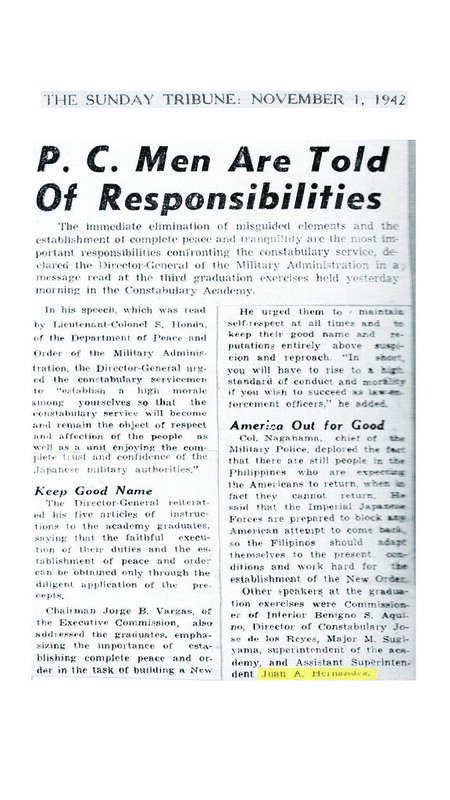 The Japanese-controlled government inagurated the new Constabulary Academy at the site of the former Araullo High School in Intramuros, Manila by June 1942. They also created branches of this school all over the country. 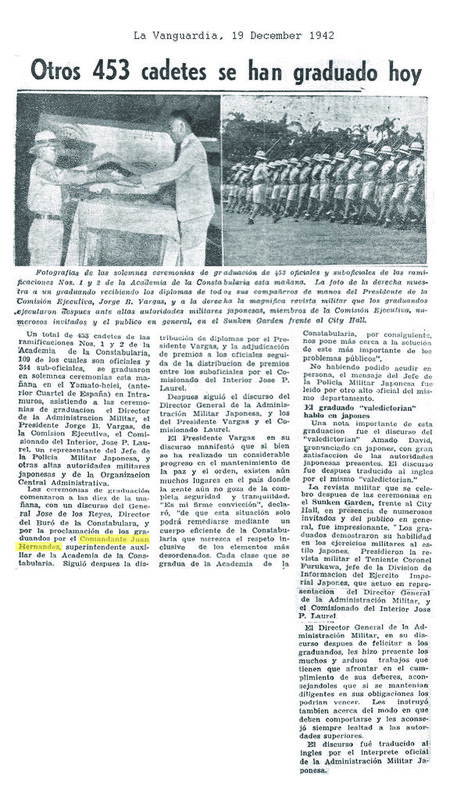 I found multiple references to Assistant Superintendent JA Hernandez participating at the graduation of Constabulary Academy that year — he was a speaker at the graduation of 01 November 1942 , then he read the roll of graduates at the 20 December 1942 rites. 3. 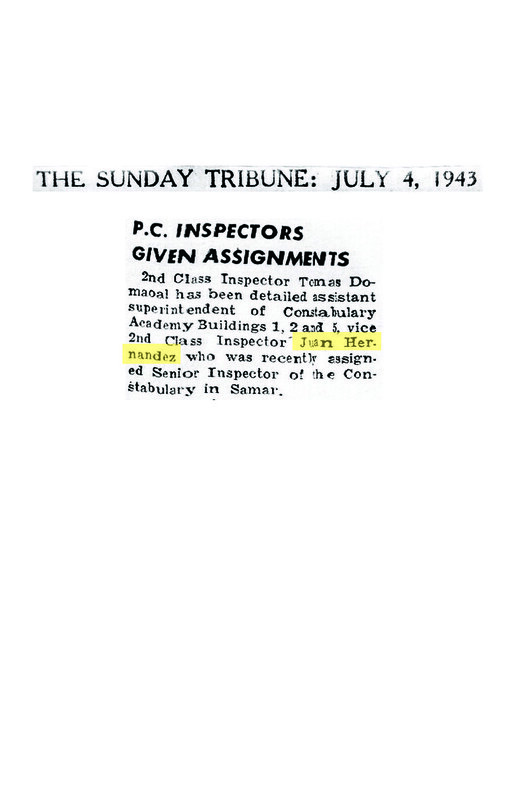 Juan must have been promoted some time earlier, as I found a document (a guest list for a dinner given by the Director General of the Japanese Military Administration, held at the Winter Garden of the Manila Hotel on 28 December 1942), which referred to him as “Major Hernandez” of the Constabulary Academy. 4. In July 1943, Juan left the Constabulary Academy for his new assignment as the Senior Inspector of the Philippine Constabulary in Samar. This is as far as I got. It would be interesting to understand the circumstances around his promotion to Colonel. I am now updating the biography of Juan Anderson Hernandez to reflect the new details above. 1. “Constabulary Staff Named: 198 Former Army Men Transferred to National Police”. Bull, 06 July 1938. 2. “Inagurates Constabulary Academy: High Officials Attend Opening”. Tribune, 02 June 1942. 3. “Names of 198 Officers of PC are Released”. Herald, 06 July 1938. 4. “PC Men are Told of Responsibility”. Tribune, 01 November 1942. 5. “Otros 453 Cadets se han Graduado hoy”. La Vanguardia, 19 December 1942. 6. 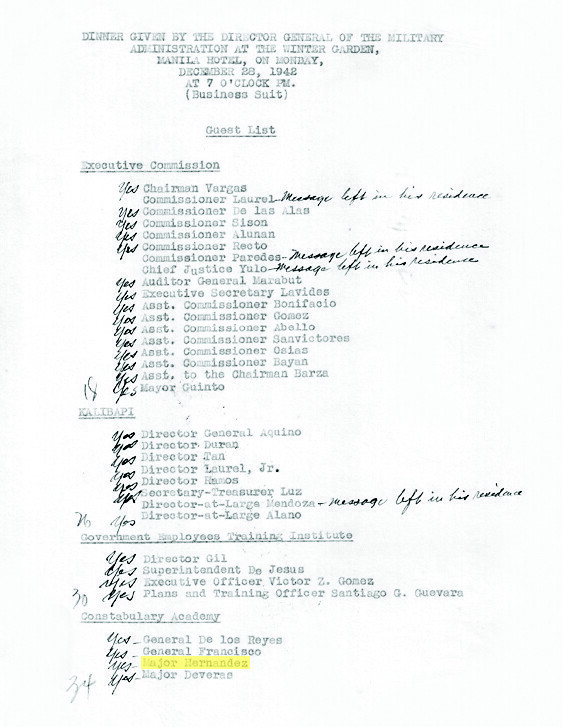 “Guest List, Dinner Hosted by the Director General of the Japanese Military Administration, Winter Garden, Manila Hotel, 28 December 1942, 7:00pm”. The Vargas Scrapbooks, Vargas Museum. Date accessed: 27 April 2011. Previous Previous post: Lola Teodora? Or Lola Lucia? In English, “our family”. These pages chronicle my continuing family history research. Aside from documenting my Filipino ancestry, I also hope to create fitting biographies for the many incredible people in our family tree and to revisit places that were once called home. The inspirations and discoveries on my path to becoming the best genealogist I can be, will find their way here. “One faces the future with one’s past.” -Pearl S. Buck.